- AWA Comiskey Park (August 27, '76) = The High Flyers (Brunzell & Gagne) & Wilbur Snyder defeated Ox Baker, Baron von Rashcke, & Mad Dog Vachon. - AJPW Sumo Hall (June 8, '82) = The High Flyers retained the AWA World Tag-Team Titles, beating Atsushi Onita & Ricky Steamboat. - AWA Super Sunday (April 24, '83) = The High Flyers & Rick Martel fell to Blackjack Lanza, Ken Patera, & Jesse Ventura. - AJPW PWF Tag-Team Title League (April '84) = The High Flyers competed in the league, which was won by Bruiser Brody & Stan Hansen. - AWA/NWA Star Wars (February 24, '85) = The High Flyers fought to a Double Disqualification with Mr. Saito & the Masked Superstar. 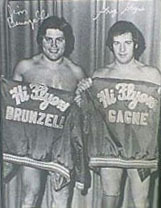 Later on, the High Flyers competed in a "Tag-Team Battle Royal", which was won by Sgt. Slaughter.